The preliminary rounds are done – and we’re not just talking about basketball. After a week of pomp and circumstance, including the adjustment to a new arena for Tuesday and Wednesday games, Central Intercollegiate Athletic Association (CIAA) weekend is upon us. Restaurants and night clubs had seen a trickle of increased traffic throughout the midweek. Now, they’re all bracing for some 200,000 visitors, many of whom will arrive by midday Friday. The city of Charlotte is thankful that the nation’s oldest African-American athletic conference kept the event in the Queen City after moving eight of its other 10 championships out of North Carolina. The moves were a response to the state’s controversial House Bill 2 (HB2), also known as the “bathroom bill,” which restricts where transgender people can use restrooms in some government buildings. HB2 karma or bad basketball? North Carolina is home to eight of the 12 CIAA member institutions, but after three days of action, no North Carolina school had won a game – men or women – against a school from out of state. The No. 3-seeded Winston-Salem State University men’s team lost to No. 2-seeded Virginia State University, 78-66, Thursday night, failing to end North Carolina’s interstate drought. Earlier on Thursday, No. 4 seed Fayetteville State University advanced to Friday’s semifinal round with a 56-49 victory over No. 1-seeded rival Shaw University, which is based in Raleigh, North Carolina. Fayetteville State will face Virginia State in Friday’s 9 p.m. semifinal round. No. 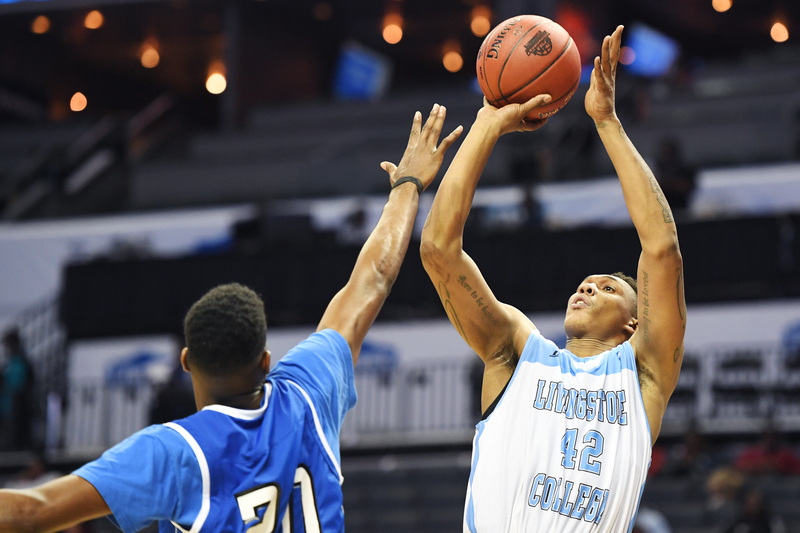 2 seed Livingstone College, about 45 minutes from Charlotte in Salisbury, North Carolina., advanced to the semifinals with a 84-78 victory over its cross-state rival, No. 3 seed Chowan University, located near the Outer Banks in Murfreesboro, North Carolina. Livingstone College forward Emarri Bailey goes up for a shot over Chowan University forward Trevis Buckhanon during the CIAA tournament on Feb. 23 at the Spectrum Center in Charlotte, North Carolina. Livingstone will play at 7 p.m. on Friday against No. 4 seed Bowie State University, which beat top seed Virginia Union in the first game of the Thursday night session. In the women’s bracket, No. 1 seed Johnson C. Smith University faces No. 2 seed Virginia Union University in Friday’s 3 p.m. semifinal. No. 3 seed Virginia State faces No. 5 seed Lincoln University in the 1 p.m. semifinal. The Johnson C. Smith (Charlotte) women’s team is the lone team remaining from the state’s two urban centers of Charlotte and Raleigh. This won’t likely help attendance, which looked to be around 2,000 on Tuesday and 3,000 on Wednesday at Bojangles Coliseum, then around 4,000 on Thursday at the Spectrum Center (formerly known as Time Warner Cable Arena). Friday and Saturday crowds for the women’s tournament have typically exceeded 6,000, but without a North Carolina school, that estimate might be generous. Livingstone’s David Duncan pulled down 30 rebounds (19 in the second half) in the victory over Chowan. He also had 13 points and three assists. Both Duncan and Blue Bears coach James Stinson were surprised by the massive number of boards. Added Stinson, whose team closed the game with a 14-5 run: “I was just thinking, rebound and box out. The hometown Johnson C. Smith Golden Bulls men’s team fell in overtime in an upset bid against Bowie State. That meant the Bulls’ tournament run would end at Bojangles’ Coliseum. They would not get to suit up for the big show at the Spectrum Center. The anguish was visible in the faces of coach Stephen Joyner Sr. and players Gabon Williams and Christian Williams. “I’ll let the players speak,” Joyner said, sliding back in his seat at the postgame press conference. Gabon Williams, a junior who played locally at West Charlotte High School, only said, “No comment,” nodding his head, visibly shaken. Fayetteville State got 17 points from Joshua Dawson and 13 points from his former high school teammate Michael Tyson in a 56-49 victory over Shaw. Dawson sank seven of eight free throws in the game’s final minutes, and hit a deep 3-pointer with 53.8 seconds left to play as three defenders pursued. 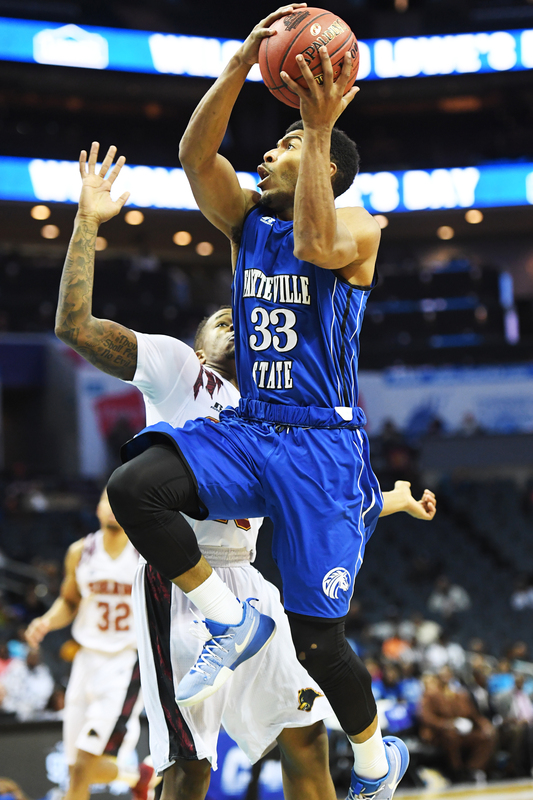 Fayetteville State guard Willie Gilmore goes up for a layup around a Shaw defender during the CIAA tournament on Feb. 23 at the Spectrum Center in Charlotte, North Carolina. The Broncos appear to be rounding into form at the right time after playing five games without Dawson, who got an indefinite suspension for a violation of team rules. Dawson and Tyson are former Kinston High School teammates of Los Angeles Lakers rookie Brandon Ingram. Dawson is also the nephew of former Kinston stars Jerry Stackhouse and Craig Dawson. Reality TV stars, rap stars, athletes and other entertainers headline a full schedule of day parties and night parties, with the bigger names appearing beginning Friday night. The lineup includes 2 Chainz, Young Jeezy, Migos, Meek Mill, Yo Gotti, Cynthia Bailey (The Real Housewives of Atlanta) and many more.